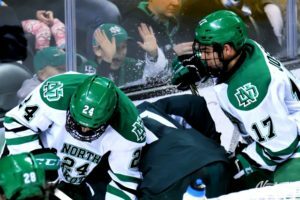 This past weekend, the University of North Dakota was unceremoniously swept by Western Michigan (4-2, 3-2) in Kalamazoo, Michigan. With the untimely sweep, the Fighting Hawks are now in danger of being on the road for the first round of the NCHC playoffs. For the last 14 seasons, UND has played the first round of the playoffs in the friendly confines of Ralph Engelstad Arena. Now, the Hawks are flirting with history, as they haven’t traveled for the first round of the conference playoffs since the 2001-02 season. That’s also the last time UND missed the NCAA playoffs and the conference championship. If the NCAA playoffs started today, UND would probably make the tourney, barring any unseen surprises in the other conference tourneys. They don’t have a lot of room for error. The Hawks are definitely a bubble team, and from here on out, they need wins. They may need to make it to the Target Center to qualify for the NCAA tournament. Ironically, that last time UND missed the NCAA playoffs, they just missed winning back-to-back NCAA championships and opened a new building that they currently call home. After winning a NCAA title in 2016, their program’s eighth, the 2016-17 season has been a bit troublesome. The Hawks could end up on the outside looking in. First things first: UND is tied for fifth place in the NCHC standings with the University of Nebraska-Omaha. This weekend, the Hawks entertain the Mavericks in an important two-game conference series. A sweep for either team would be huge. If UND has aspirations of making the NCAA tourney, they can’t afford to have another pointless weekend. With the regular season coming to an end, we’re getting down to crunch time. College Hockey’s version of March Madness is almost here. With the impending conference tourneys and NCAA playoffs quickly approaching, the Hawks are looking to clean a few things up and regain their scoring touch. Fans can panic if they want to. @SchlossmanGF and @goon48… do that thing where you tell us everything's okay and we shouldn't panic. Here are three things from last weekend’s series against the Broncos. Even though UND went 1-3-0 in their season series against WMU, the Fighting Hawks didn’t play all that badly against the Broncos. They deserved a better fate at Lawson, as they outshot the Broncos 80-60 but couldn’t get a win. In 120 minutes of hard-fought hockey, UND was only able to get four goals past Broncos freshman Phenom goalie Ben Blacker. Not many teams can win averaging two goals per game. Saturday night, Blacker was a brick wall, stopping 44 of 46 shots, including 34 over the final two periods. Many of his saves were of the tough variety. During the third period, Blacker robbed Tucker Poolman from in close to preserve the Broncos’ lead. In two games last weekend, Blacker was 2-0-0 with a 2.00 GAA and .960 save percentage. Blacker’s performance left the Hawks scratching their heads and looking for answers. During Saturday’s game, the Hawks put an eye-popping 46 shots on the Broncos net. In the final two periods, the Hawks had a 34-7 edge in shots. UND’s top line of Tyson Jost, Brock Boeser and Shane Gersich alone put 23 shots on the Broncos’ net. High shot totals aside, the top line was only able to get one goal (by Gersich) past Blacker. That’s the story of the Hawks’ season. They can’t get any puck luck, and they’re not getting a lot of scoring from their top-six forwards. How bad has it been? Jost has scored one goal in the last five games that he’s played in (one goal and three assists for four points). Boeser is goalless in the last nine games (four assists over that span). Gersich, the team’s leading scorer, has scored one goal and one assist in the last five games (1g-1a—2pts). Austin Poganski has scored one goal and three points in the last 12 games. Finally, Rhett Gardner has one goal and three points in the last eight games. Do you see where this is going? You’re not going to win a lot of if you’re not getting scoring from you top forwards. The law of averages says that an avalanche of goals could be on the way. Make no mistake about it, UND fans aren’t happy with the recent turn of events. For the fans, it’s been a frustrating season. With time running out, UND fans are still waiting for the traditional second half surge. That hasn’t happened yet. Since the calendar turned to 2017, UND has a 5-7-0 record. Nothing has come easy for this team. I know fans are frustrated, but UND lost a lot of talent from last season’s team. I am not shocked that they have fallen off a bit this year compared to last year’s team. I don’t think the players are that happy with the way things are going, either. I’ve not seen a lot of happy faces during the season. Before we throw the team under the bus, I think there are a few things to consider. First, missing from last season’s championship team are three very experienced and talented defensemen (Paul LaDue, Keaton Thompson, and Troy Stecher). Those three veterans chose to forego their college eligibility and sign professional contracts. They have struggled at times as rookies. Here are three defensemen that could still be playing with the Hawks. Second, the three aforementioned players have been replaced by three rookie defensemen (Casey Johnson, Andrew Peski, and Colton Poolman). So, I don’t think it’s unreasonable to expect them to struggle. Yes, I do agree, Christian Wolanin has struggled mightily this season. Finally, something else to consider: last season, UND gave up 1.8 goals per game. This season, that number has changed drastically; through 30 games, UND is giving up 2.5 goals per game. There’s no substitute for experience.